Should we prune camellias ? The answer is yes, without hesitation, all species and varieties included, even those whose growth is slower. It is beneficial and enhances the bloom to come, it shapes young subjects by allowing them to branch out and expand. 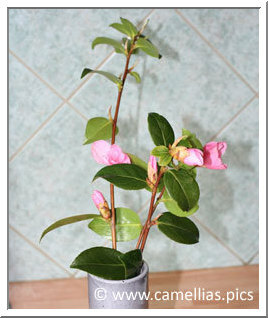 Finally, it allows older subjects to keep a good shape, and, why not make bouquets. You can prune during the bloom (to put a flower vase), just before its end (before new growth) or at the end of flowering. 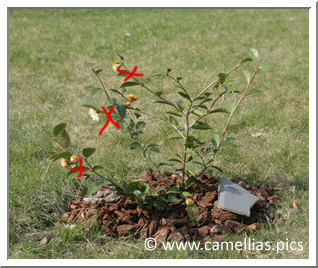 Ideally, Watch your camellias and intervene when necessary. 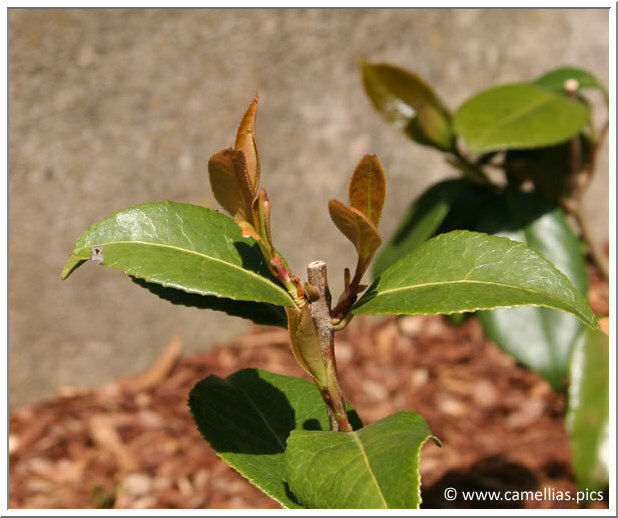 Regardless of the importance of the formation pruning for the young subject, it is also important to understand the further development of your camellias. A camellia can become a tree, and invade a small garden. 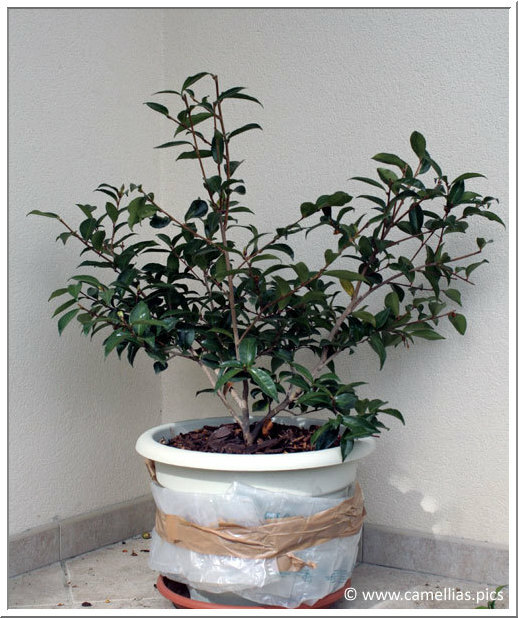 It's up to you to know from the beginning if you want to leave it free when it has reached its adult size, or whether you want severe pruning to contain a more extravagant subject ... It is a matter of taste, but things can go very quickly, so you can, very quickly, be overwhelmed by the size of your camellias. 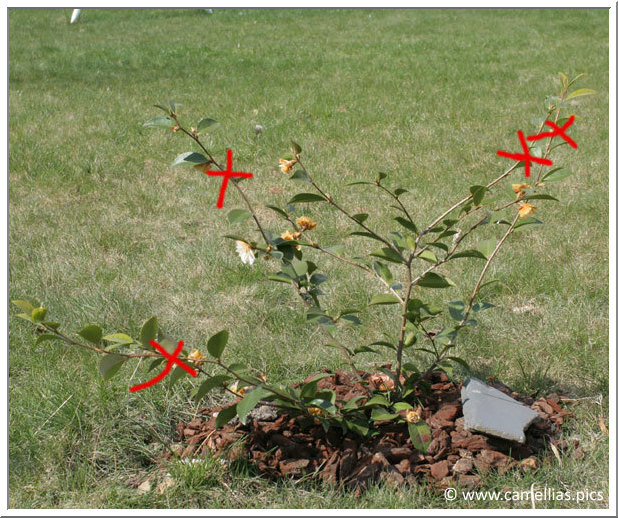 Do not wait, when growth restarts, otherwise you may jeopardize the coming year flowering. 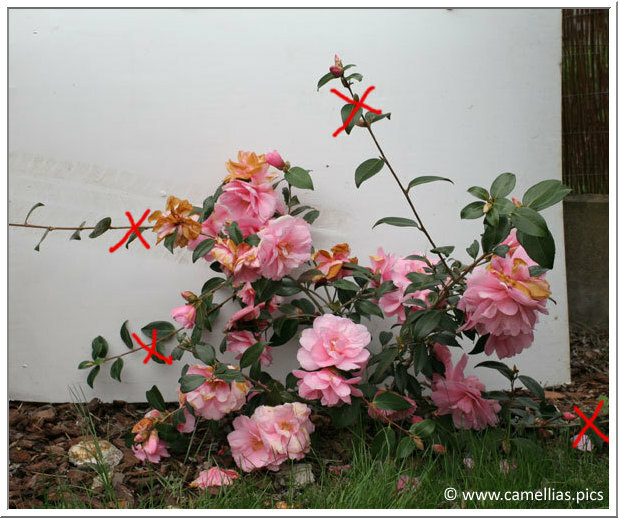 Don't forget to spread some fertilizer at the foot of the camellia. 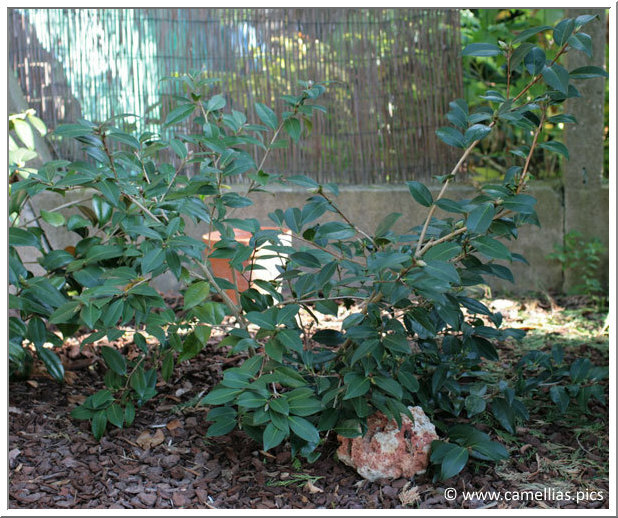 Prune lightly camellias with slow growth, and more generously those growing rapidly. 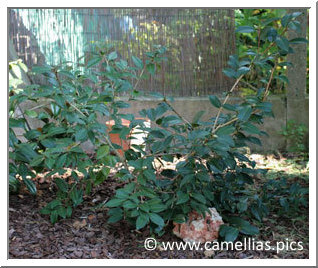 To help, here are photos and reviews how I did in April 2006 with some of our camellias. 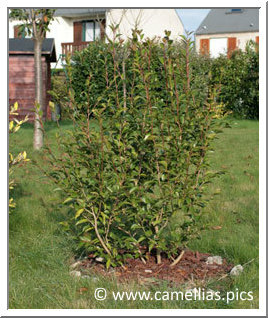 First, here is 'Cinnamon Cindy', a hybrid with spectacular growth. 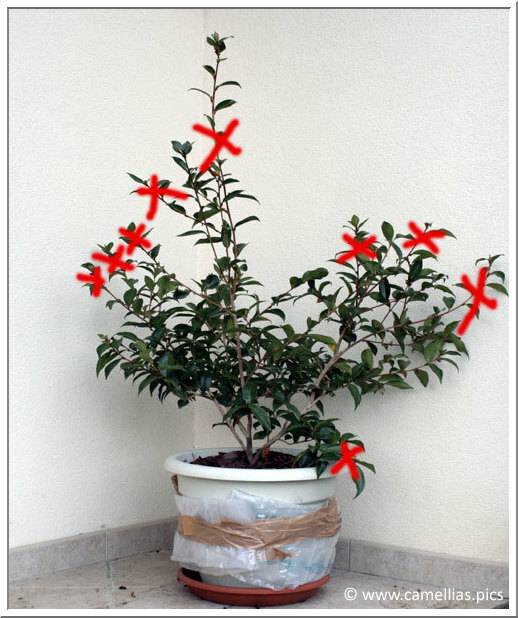 This young subject needed a severe formation pruning. The principle is to give it a shape, thus equalizing the branches. 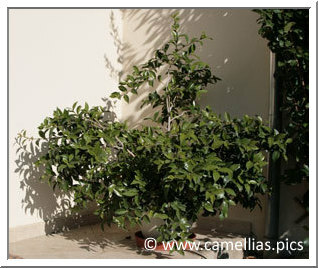 Prune generously stronger branches, and cut the end of the smaller ones. 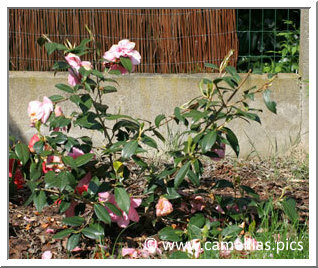 We will operate in two phases, the first (above) at the end of flowering. Here is an intermediate result. 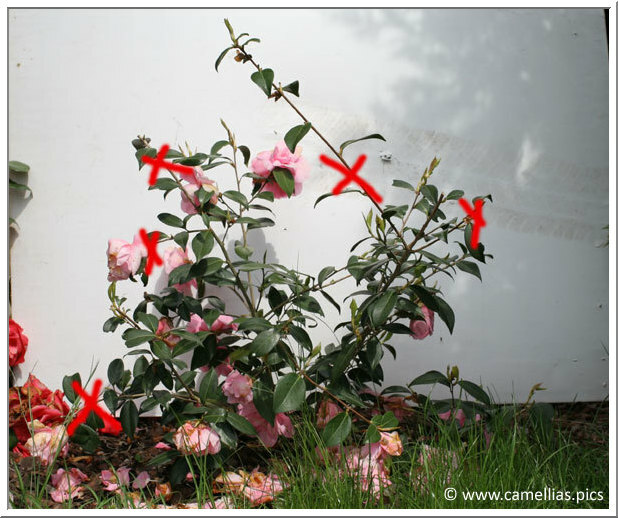 When the last flowers are withered or fallen, slightly resize the branches that holded them. Here, in October 2007, 'Cinnamon Cindy' after spring pruning. It took the slender shape that characterizes it. In the future, I will only do maintenance pruning. Some camellias have a rather peculiar strength. If you do not constraint them, they can become uncontrollable. It is about choice: either there is room and you love very loose habits either you intervene, even severely (it will give a better shape). 'Donation' is an excellent example. During flowering, you may take branches to put in a flowerpot. Do not hesitate to cut largely those that do not have buttons (or small buttons). A little later during the (long) bloom, continue to give a rounder shape cuting the branches end or cutting more severely branches that permit. 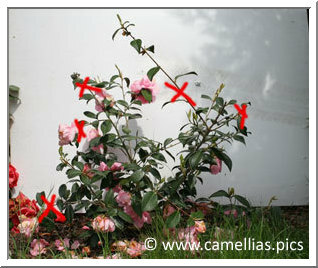 At the very end of flowering, if the recovery is not too advanced, you can cut ends again. In autumn 2007, 'Donation' has just expanded its port but keep falling. I prune him each spring to keep a certain shape. It aims to maintain a uniform silhouette. You can wait for the bloom to intervene, watching the beginning of the recovery. With 'Jean May', a sasanqua, we have a little time between the end of flowering (late February) and early recovery (during April). We can take this opportunity to repot and give fertilizer. 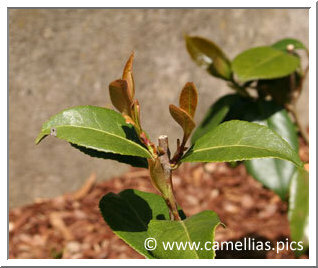 This camellia is growing very fast. I let go a little to his liking. I'll give it a slightly more rounded shape. 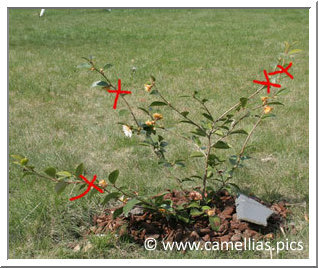 I cut severely the larger branches and I cut the ends of smaller ones. 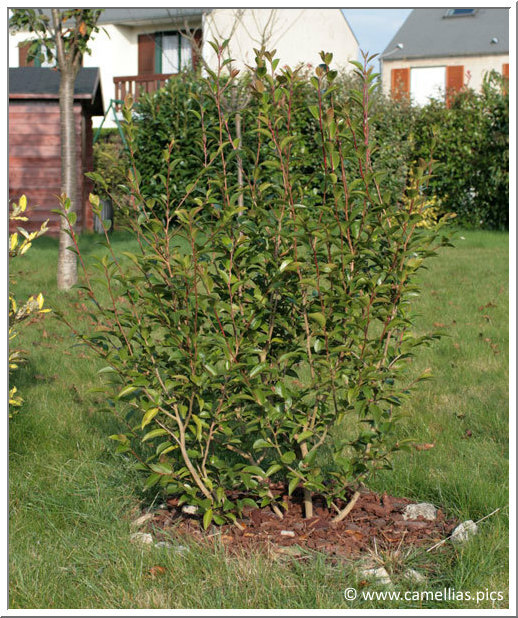 In autumn 2007, we see that the shrub has developed and grown. 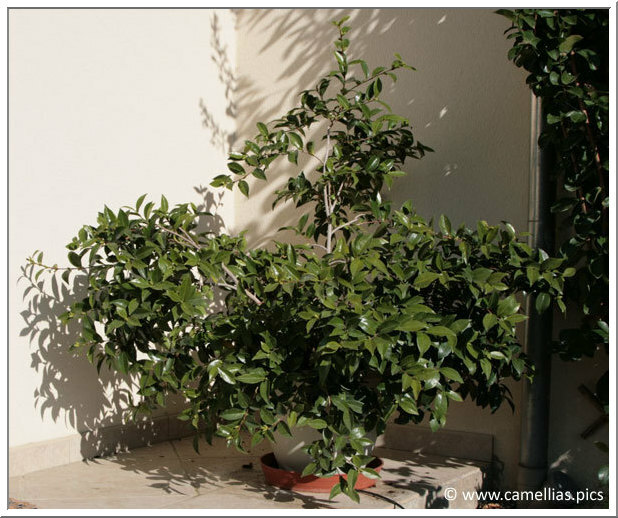 In spring, I still do maintenance pruning (more or less), and a repotting. To put a flower in a vase, do not wait for the blooming of the bud to cut the branch. In water the buds continue to mature, no need to wait until the flowers are open. 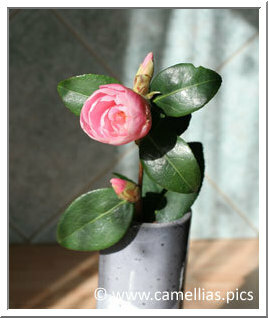 Watch out the quantity of water in the vase, the camellia needs water.